DeGeneres showed the audience a photo of her dislocated finger. It turns out laughter really is the best medicine. Ellen DeGeneres welcomed Claire Danes on her daytime talk show Tuesday, but before she sat down to chat with the "Homeland" actress, she had an announcement to make. "I have something to show you--it's that right here. Can you see it?" DeGeneres asked, directing the camera to show her splint. "I broke my finger. I know what you're thinking: 'How can you host a show without the tip of my ring finger?' I am not gonna let this thing beat me. I am not." "So, you know how in gymnastics when you do a one-handed cartwheel and you have to spread the weight evenly between all your fingers? Well, I had two glasses of wine and fell into a door," DeGeneres continued, adding that she and wife Portia de Rossi "were coming home from a dinner party" and were "almost at the front door" when the accident occurred. 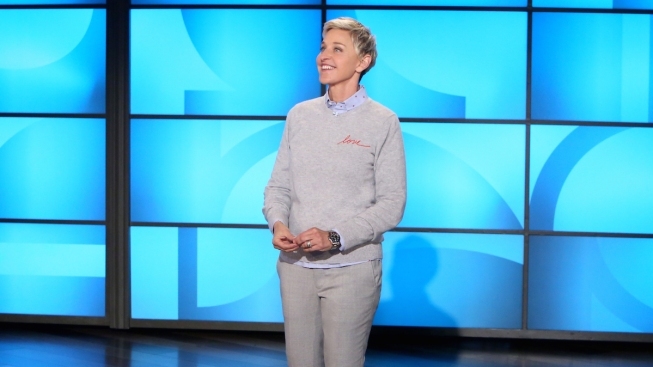 To her audience's surprise, DeGeneres showed a photo of her dislocated finger. "I should have warned you. Don't look at that. If you're squeamish, don't look at it," she told them. "I'm sorry." "My first thought was, 'No big deal; Obama Care will cover this.' So, Portia drove me to the hospital--to the emergency room--and when I got there, of course, the receptionist had so many things for me to sign: a picture for her nephew, a T-shirt for her," DeGeneres joked. "No, they were wonderful. UCLA, thank you so much...There was a lot of people who were helpful, but Tammy, thank you so much. Tammy was my nurse who was taking care of me." DeGeneres then showed an X-ray of her finger. "Don't worry--this isn't as bad as the last one I showed you," she said. On second thought, she said, "Maybe it is. I was wrong. It's worse. I'm so sorry." Fortunately, DeGeneres didn't break her finger after all. "I dislocated my finger. That's what they call it, which is an incorrect term because I knew where it was located. It was just wrongly located is what it was," she joked.